Sühring. Not what you’d expect a restaurant located in bustling Bangkok to be called – but this isn’t your average Thai restaurant. It’s an unexpected taste of Germany in BKK, and possibly the first German tasting menu I’ve come across in my world travels. 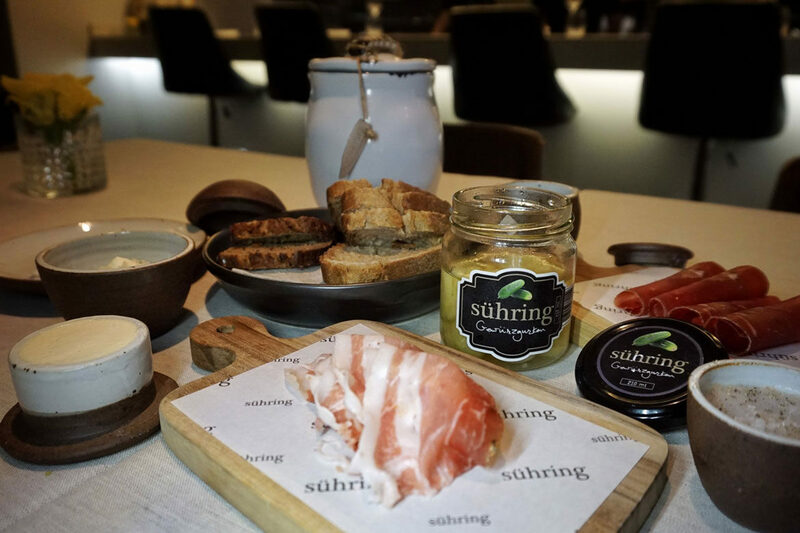 Sühring is part of the new wave of Bangkok restaurants championing foreign cuisines, and it should be on your list when visiting the Thai capital. Set in a gorgeously moody, architecturally interesting house surrounded by atmospheric foliage, Sühring feels like something special from the moment you approach the front door. The simple, lowercase font adorning the sliding glass door entrance is as unassumingly sophisticated as the menu to follow. 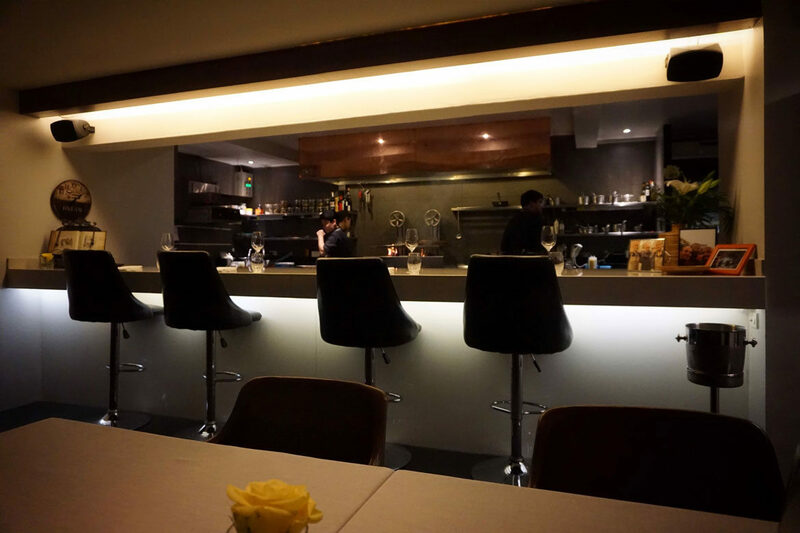 We were lucky enough to be seated at one of the two tables that have a view into the kitchen (there are four bar stools in this area also) – so if this is your thing, be sure to put a request in for these spots. 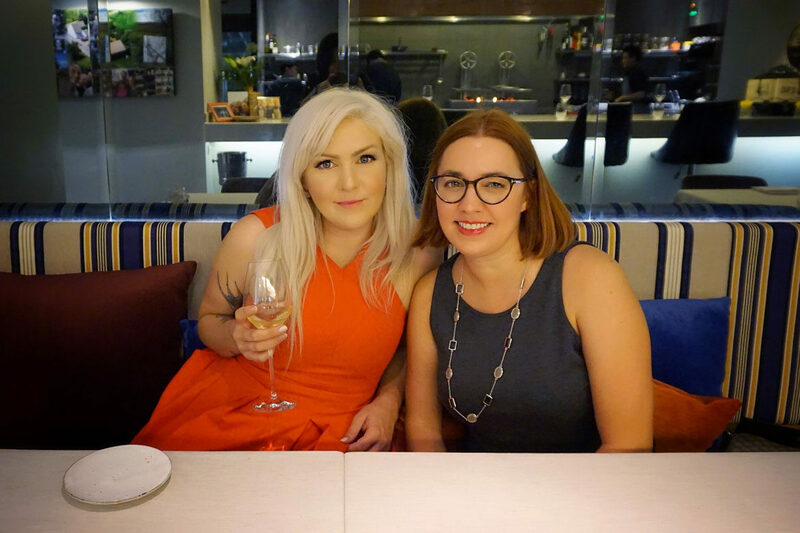 We explored Sühring’s 12-course menu (there is also an 8-course option), which comes in at 3,276THB including all applicable taxes. That’s a mind-blowing 86 Euro. EIGHTY-SIX EURO. You can pick your jaw up off the floor now. Want the wine pairing? Add 2975THB (78 Euro). Prices like these paired with quality such as that being served up at Sühring are fast giving Bangkok a reputation for being one of the best value gastronomic destinations in the world. 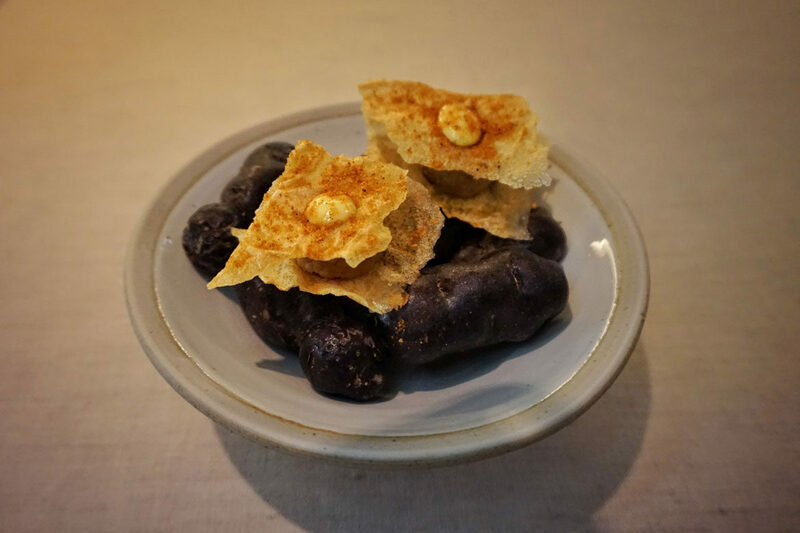 You could probably indulge in all of Bangkok’s greatest culinary hits for the bill you’ll be served up at a single 3-star Michelin dinner in Paris. 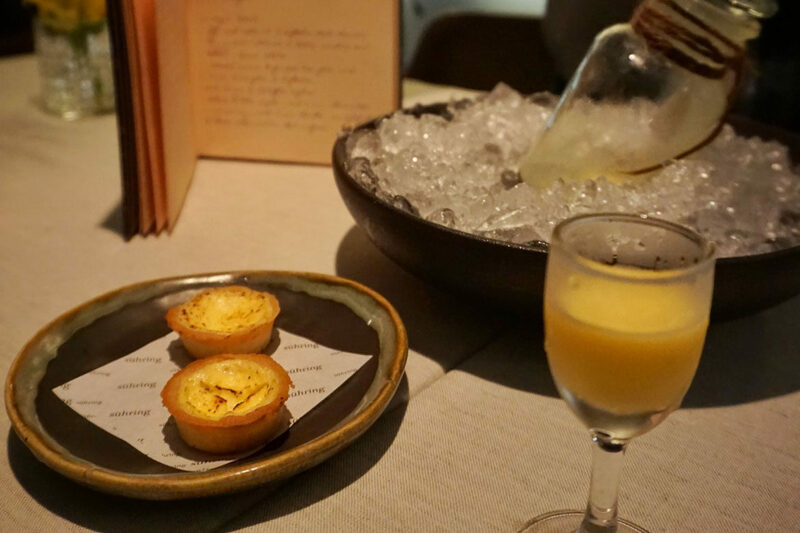 A tasting menu like this one is obviously going to draw some comparisons with the city’s tour de force, Gaggan. 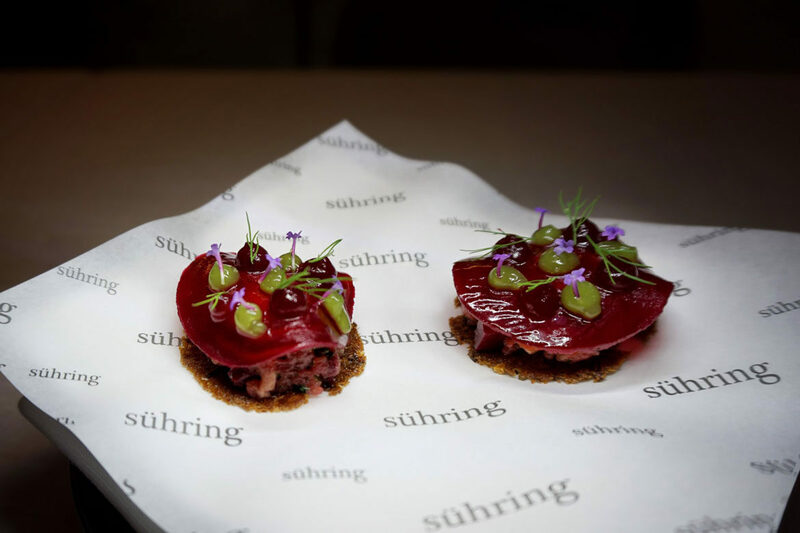 It’s a comparison Gaggan himself would welcome, given that he’s a backer of this very restaurant, and his relationship with the fabulous Sühring twins stretches back many years to their time together cooking at Lebua State Tower. You’ll notice I said twins…and not just twins, but identical twins. If you think you’re seeing double when dining at Sühring, you can now rest assured that it’s not the booze talking. The charming Mathias and Thomas are the only identical twin powerhouses behind a world-class dining establishment that I know of, and the sense of family runs strong through not just the establishment, but the menu. Memories and family recipes feature prominently in bringing a piece of the twins’ heritage to steamy Thailand. The snacks start off in spectacular fashion. 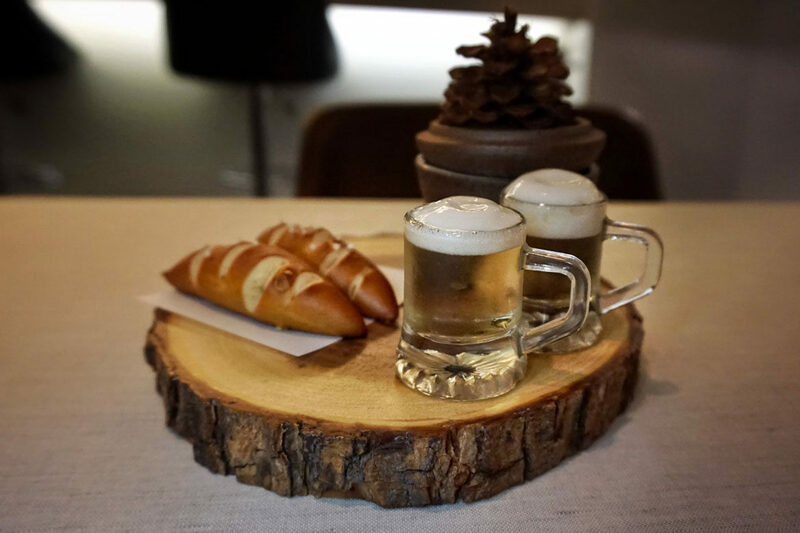 Does it get any more German than a pretzel and a (teeny, tiny) ‘beer’? I don’t think you could commence the meal in a more perfect fashion if you tried – the memory still makes me smile. What follows is a line up of hearty german classics in miniature, even a delicate slice of pork knuckle sandwich. 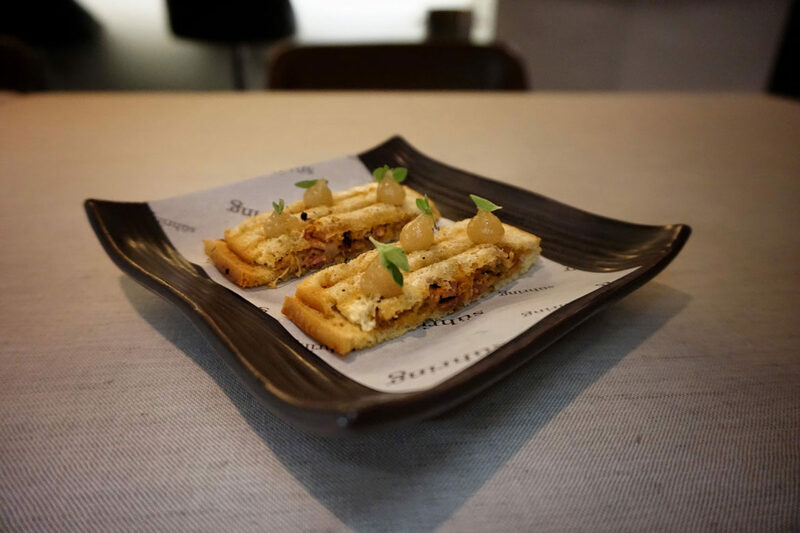 All the small bites were utterly delicious, and you might spot a little homage to Gaggan’s Salli Boti in there too (“Frankfurter grüne Soße”). 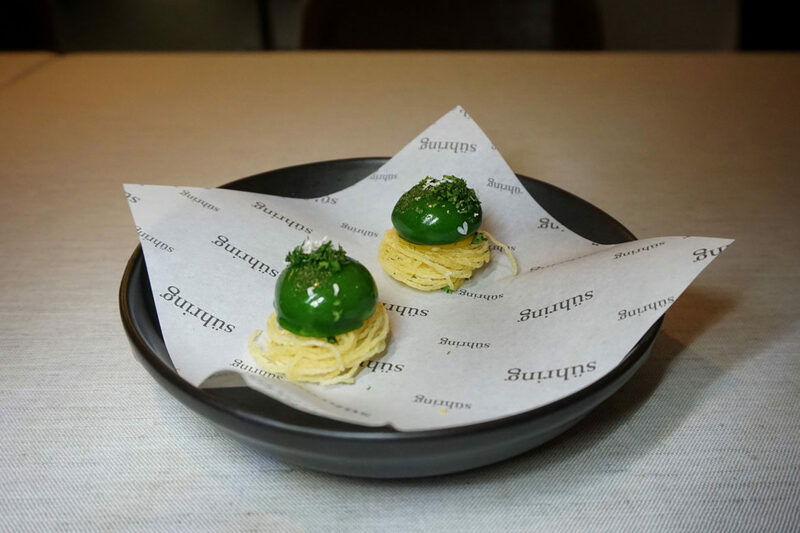 It takes the form of a sphere of herb sauce from Frankfurt consisting of seven herbs, sour cream, vinegar and mustard that usually accompanies egg and potatoes apparently (thanks Instagram for those details), the potatoes in this snack being the nest the sphere sits atop (a la Gaggan’s ‘salli’). The 26 leaves salad interlude was a refreshing stop along the decadent tasting journey, but it’s not often you see salad on a tasting menu. A nice change. What followed was even less traditional – an extensive bread and charcuterie course, complete with house-made pickles and cured meats. The next dish, “Spätzle”, was the highlight of the evening. This is indulgent German comfort food. 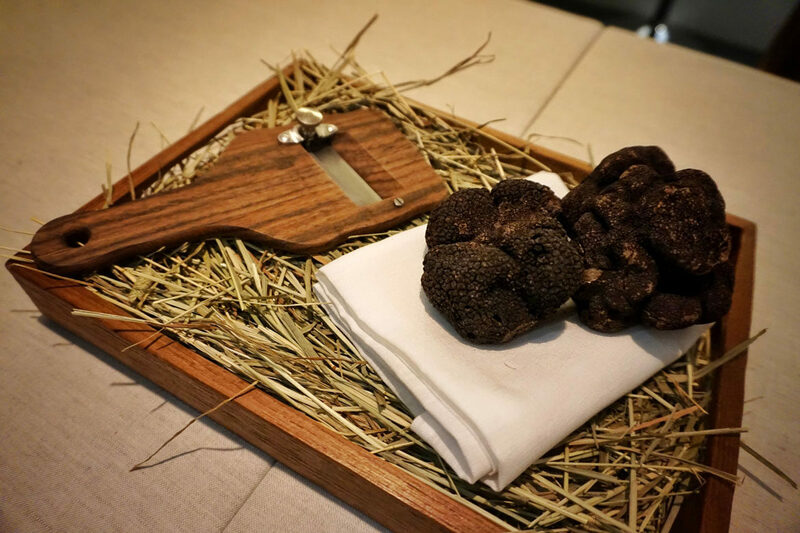 I definitely recommend adding the truffle option to turn up the indulgence factor even further. Trust me, you’ll mourn the departure of this dish as soon as the last spoon full has left the plate. I need to go back just for this dish. The menu at Sühring is protein heavy, and that suits me just fine. 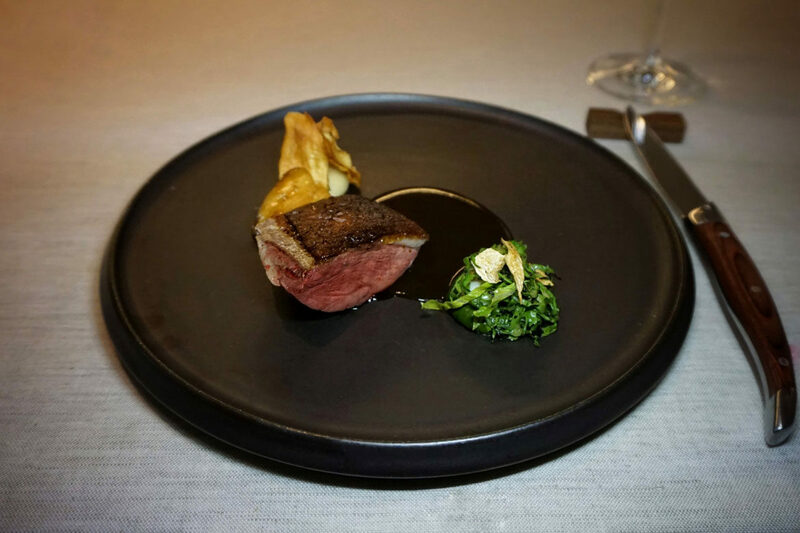 Each meat course was more delicious than the last – the duck sublime, the wagyu incredible. Both were incredibly tender and flavourful. The only miss was the lamb – this was really the only misstep of the night, and I’d recommend this dish bites the dust. The real highlight of the dessert portion of the menu, however, was “Großmutters Eierlikör”. It’s a German eggnog of sorts, and the recipe comes from the intricately handwritten recipe book of the twins’ Grandmother that is presented to you at the table. A fantastic story in concept alone, made even better by the fact that the Eierlikör is absolutely divine! I’ve never been an eggnog fan, but this…I could drink this every night (clearly demonstrated by the fact that we went through three rounds of the silky sweet liquor). 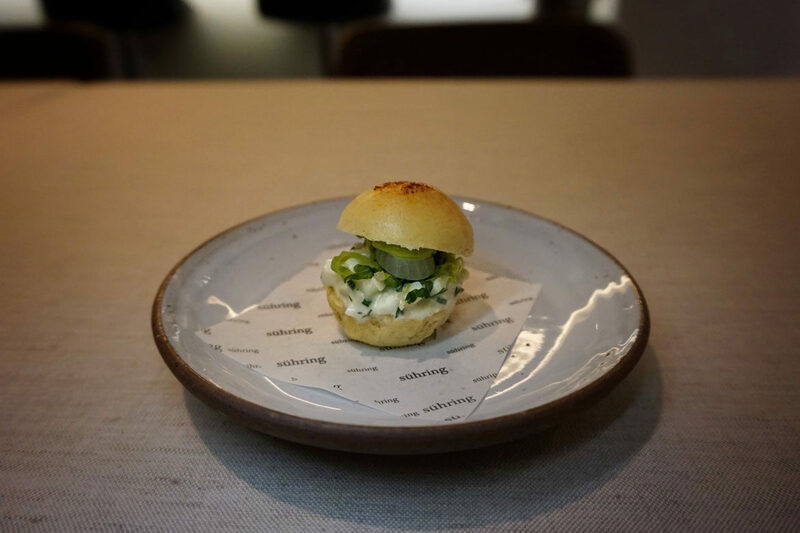 Sühring may be relatively new to the Bankgok scene, but the many years of experience gathered by the brilliant team see this establishment achieving top marks right out of the gate. It even rocketed to #13 on Asia’s 50 Best 2017 as a new entry. Somehow everyone just knew that Sühring would make an impressive debut, but that takes nothing away from their incredible achievement. The amazingly knowledgable Restaurant Manager Mathieu made our dining experience such a joy, welcoming us like family – and it’s this essence of family that the Sühring team have woven through not just the food, but the hospitality, that will really leave a lasting impression on you. 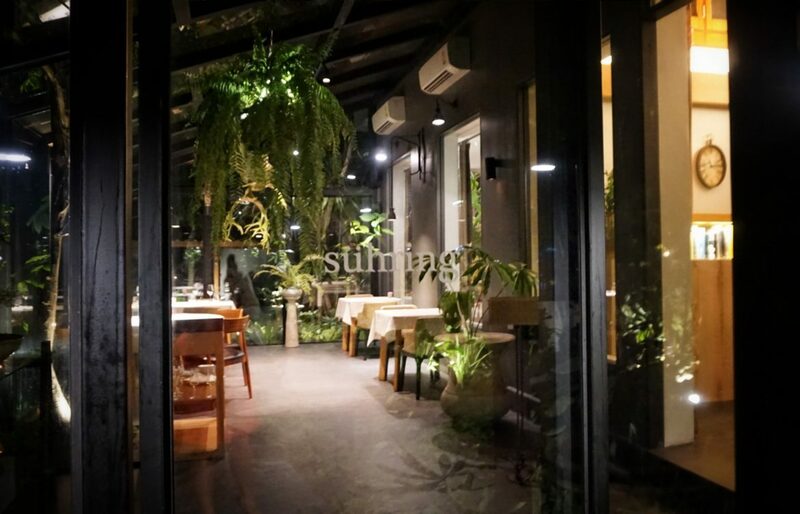 A must visit in Bangkok – I can’t wait to visit again and try a new menu. 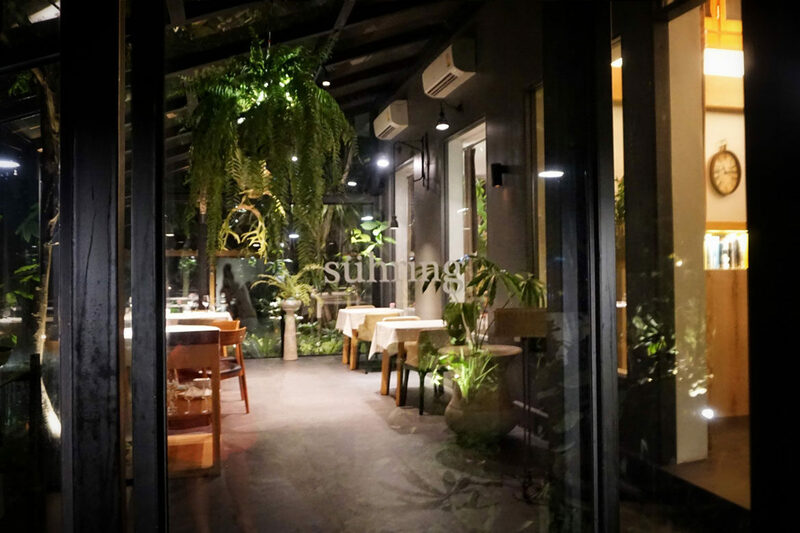 Being set in Bangkok, Suhring represents fantastic value on the international fine dining scene. 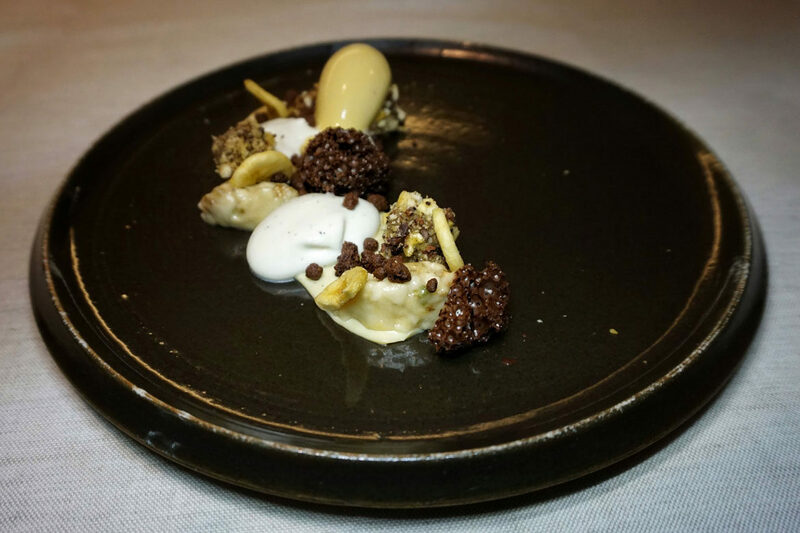 Who knew a German tasting menu could be this good? Warm vibes and service with personality will leave you with long lasting foodie memories. Oh, and that Eierlikör....that Eierlikör!! Ok, so the lamb didn't reach the highs of the other dishes. That's about all we can fault.